It makes sense that those surviving in the securities lending business would look overseas for inventory. If you are a broker dealing in rehypothecation, you go where the portfolios are stocked with pristine assets. Who holds the most UST’s on the planet? It used to be insurance companies (and their subs) who were more than willing to lend them out for a spread. Long before the crisis, foreign institutions had begun stockpiling UST’s and other “reserve” assets like them. For awhile during the housing bubble, US agency debt and even some carefully sold versions of MBS were accepted as the best regardless of where they ended up as “owned.” Overseas entities, mostly sovereign wealth funds rather than strictly private banks, gave securities lending brokers another silo of collateral from which to draw. It was also another potential bottleneck, not that anyone saw it coming. That’s the biggest thing about the crisis in 2007 and 2008; all of these various eurodollar, cross-border functions were pictured as robust and reinforcing. Liquidity and monetary fears were seemingly allayed by the menu of flexible, dynamic liability choices, and more than that supposedly “safe” options in places like repo. As it turned out, collateral flow was as susceptible to breakdown as unsecured lending. You can even make the argument repo was worse for fomenting further crisis than what traded under LIBOR. An enormous collateral shortage developed as flow was interrupted. The geographical boundary proved as difficult here as anywhere else. 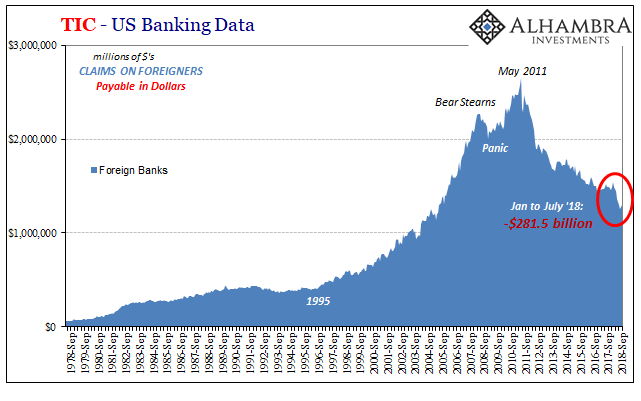 The collateral system has not received the attention it deserves even after eleven years, the consequences being paid by real economic disruption globally. 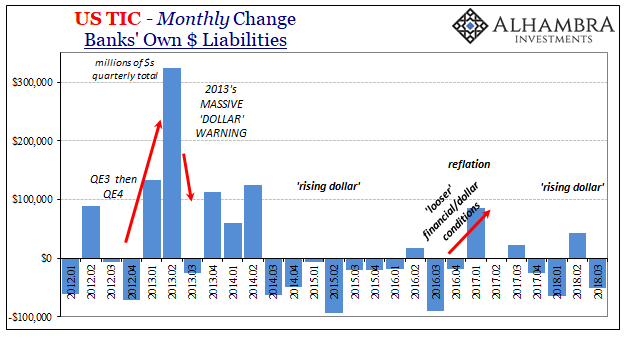 The Treasury Department’s TIC series again proves invaluable. 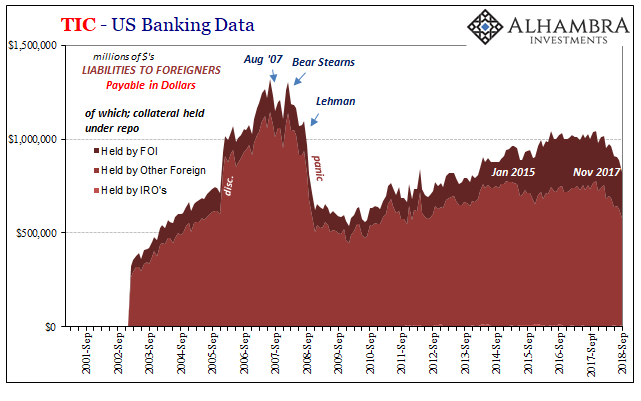 It is the only data available that I know of documenting a lot of what banks do into and out of these eurodollar (again, using the term eurodollar as a euphemism for dollar transactions of all kinds offshore) spaces. There is even a series on collateral. 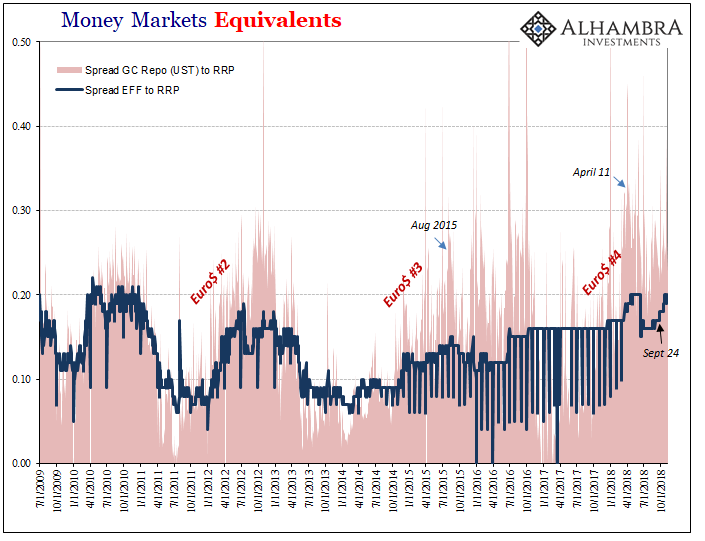 It is incomplete, I’m sure, so it doesn’t cover everything, but how it aligns with the history of market breakdowns and things like the role of collateral in them suggests there is enough here to make some good judgments. One of the first things you note (above) other than the 2008 panic is the 2014-16 period. The “Other” foreign institutions began having second thoughts about repo with US banks in January 2015 (which way doubted which way, who really knows?) Stepping in for them were these FOI’s, or Foreign Official Institutions often overseas central banks. When I often put “selling UST’s” into quotes, this is one of the reasons I do so. FOI’s who mobilize their reserves aren’t always straight selling those assets; it may look that way depending upon the accounting and arrangements, but in fact they may be lending them out for their own repo use or to be borrowed and used elsewhere. The accounting on both sides isn’t always straightforward, and, as noted above, there really isn’t a whole lot of data which settles the exact nature of these transactions. 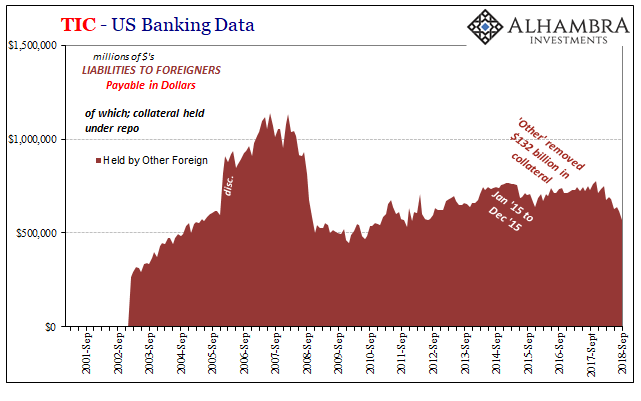 What we do know from TIC is that “Other Foreign” firms removed $132 billion from what was “collateral held under repurchase agreements”, these liabilities of US banks to foreigners (payable in dollars). 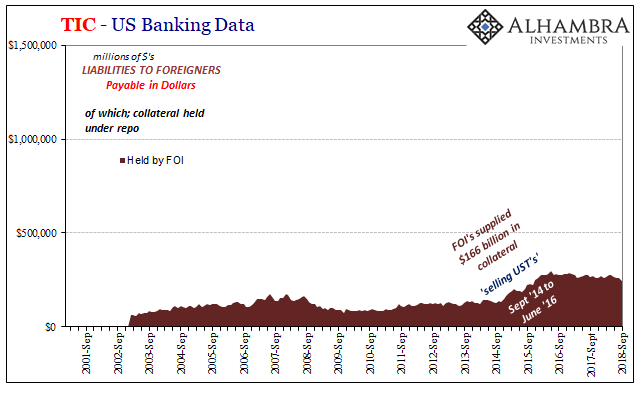 In their place, FOI’s substituted $166 billion to try and stem the eurodollar run – that included a very clear repo component (just like 2008, if not nearly to that size). The data on repo fails isn’t an exact match for what we are looking at via TIC, but again it’s close enough. There were clear collateral problems domestically, or at least in the runs of Primary Dealers reporting them to FRBNY, starting in June 2014 which then picked up in intensity again following CNY’s break in August 2015. This seems to be the established pattern, where domestic repo issues lead to disruptions in offshore places. It has been repeated in late 2017 and especially 2018 – and then some (below). 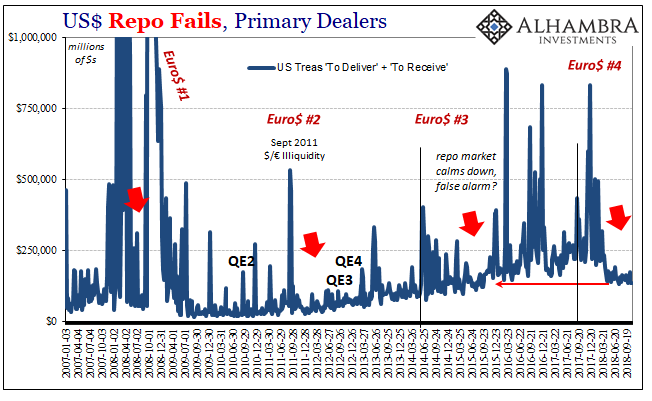 Repo fails for Primary Dealers surged in September 2017, raising our first alarms that “something” eurodollar negative was in the works. According to TIC, that began to register in foreign repo/collateral by December. Since the end of November 2017, more than $200 billion has disappeared from “Other” foreign firms in the category of collateral held under repo. The key difference this time, and what may have been the biggest shock this year, is that FOI’s, these other central banks, did nothing about it. They just let it happen, which may account for why the EM crisis/”rising dollar” (and gold) was so severe and condensed. This suggests, obviously, a disruption in collateral flow for reasons we can’t know (but we can speculate, as it is often the case of balance sheet capacity among securities lenders). The lack of FOI participation further proposes that these offshore central banks are skittish about “selling UST’s” at least in this format, a possibility we know pretty well from Chinese behavior this year (until recently). Perhaps they learned something from 2014-16 after all. Not that it matters much because Euro$ #4 doesn’t seem to be abating. In fact, it may just be getting started; the collateral stuff a prelude to more, just like the transition from domestic 2014 repo fails to foreign 2015 collateral switching. The rest of the TIC data for September 2018, of which there is a lot, is relatively unremarkable in that it continues to indicate what we’ve already discussed for the last year or so. Some kind of a pause or relenting is suggested for September, a small rebound in claims on foreigners and some other places consistent with relatively better market conditions in that month. 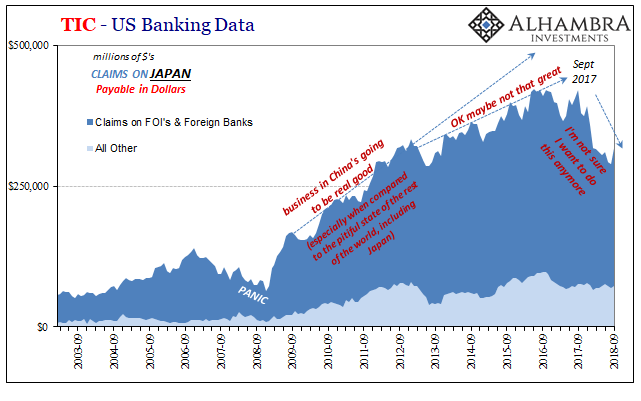 The one piece that stood out that way was cross-border relations with Japanese banks (+$27.7 billion in September after -$130.8 billion September 2017 to August 2018), maybe explaining why a mini-reflation trend appeared in September. If Japan was to blame for the liquidations in January, big drop, then their return might account for a better baseline. Perhaps institutions in Tokyo were enthused about the August wage data after all. Given what happened in October, I doubt it lasted very long. We will have to wait another month for last month’s data to see if Japanese banks played a role in the October liquidations (and term oil turmoil). Collateral is a huge piece of the global wholesale liquidity puzzle, especially offshore. It is, in essence, a form of reserves that functions in ways the Fed’s bank reserves cannot. If you have access to collateral, then you can keep your liabilities liquid and rolled over especially rehypothecated. Predictable and manageable. If it’s hard to find and costlier and more difficult to obtain, you won’t be the only one scaling back. None of this has anything to do with trade wars, “rate hikes”, or T-bills. It is instead a broken global reserve currency system that lumbers forward in time and backward, intermittently, in economy. The very clear collateral contributions to Euro$ #4.